My little sister is now a Mrs. 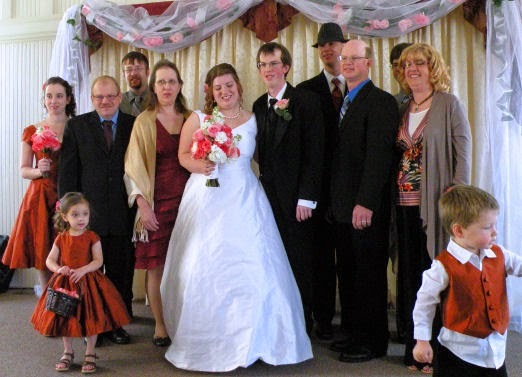 The wedding was lovely, not too big, but not pathetically small either. A bunch of people were up way too late decorating -- including the bride who did not sleep at all the night before! -- but I bowed out with the excuse of getting my own kiddos bathed and off to bed at a decent hour. 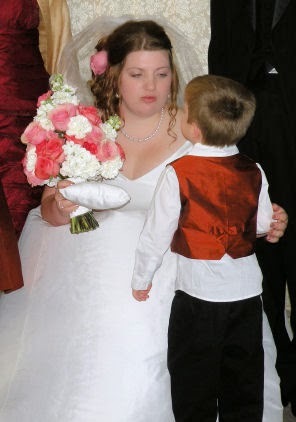 In addition to the bride's gown, I sewed my (matron of honor's) dress, the flower girl's dress, the ring bearer's vest, the flower girl's basket lining, and the ring bearer's pillow. 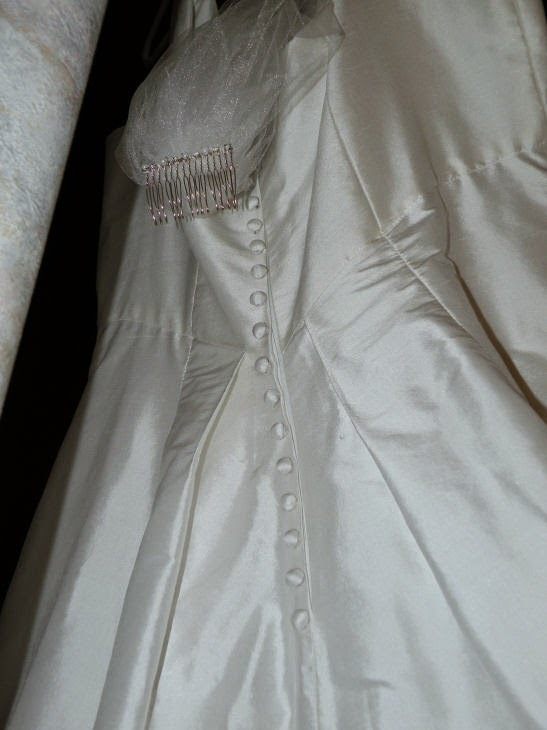 I finished sewing buttons on the dress at our hotel the day before the wedding. 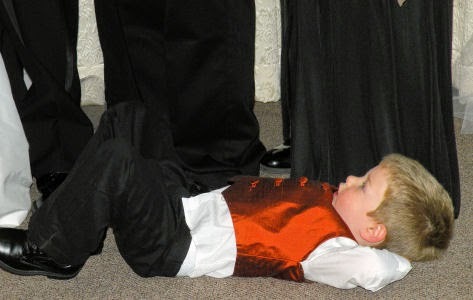 The poor little ring bearer didn't get enough sleep the night before and wasn't in any kind of mood to cooperate -- we even tried bribing him with M&Ms, but to no avail. He ended up doing his own thing. It could have been worse! It was actually quite charming and as it didn't stress out the bride, no one much minded his antics. Miss M was rather aghast at his behavior (she's only 3 months older than he is, but is quite the sophisticate). Little Guy sat with Daddy and was an absolute doll. 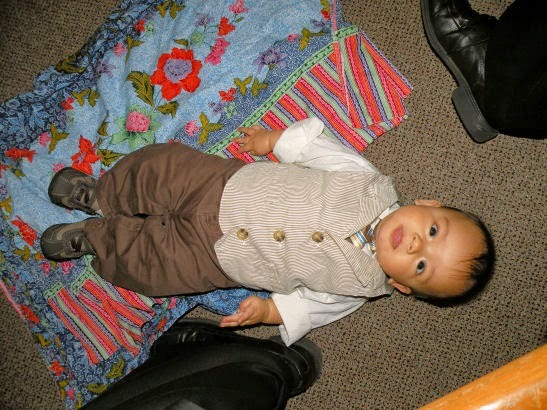 Just look at him, lying on the floor between Daddy's feet as sweet as can be in his little vest and tie! Did you ever know a baby that spits at you when he's happy? It must be some sort of odd baby greeting. 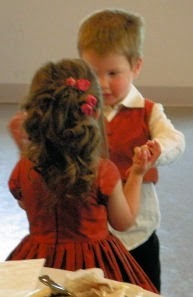 At the reception, Miss M and her cousin danced together. He, of course, thought they were still playing ring-around-the-rosies and would fall down at random intervals which set Miss M to giggling. We all had a wonderful time, but I think everyone, bride included, is glad it's over and we can get on with our lives again! 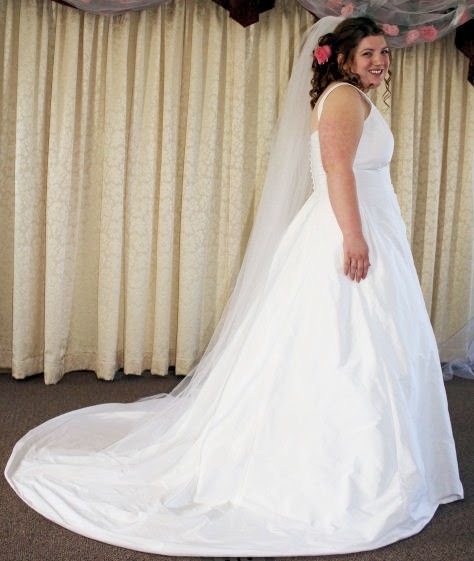 Once I get caught up on laundry and dishes, I'll write up a review of the pattern I used for the wedding gown. Wow! You did a fantastic job on the dresses and vest! You did an absolutely amazing job! Everything looks wonderful. Very well done! You did an amazing job on the dresses. 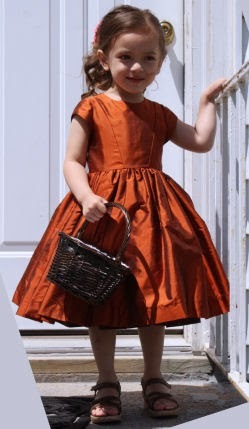 I recently made my daughter a flower girl dress (the wedding was on April 22), but I don't think I would ever dare make a wedding dress! Thank you! It is really quite a job doing a wedding dress...especially for someone other than yourself. It was rewarding though and I'm glad I did it.